Terms & Conditions - Andertons Music Co. Here at Andertons Music Co. we're dedicated to your total satisfaction, and that means being totally transparent about how we use data and new technologies. So these aren't just your regular boring terms and conditions, we've gone the extra mile to explain how the more advanced features of our site work and why we do it. Nothing in these terms and conditions affects your statutory rights as a consumer, of course! When shopping with Andertons Music Co. online, you can pay using all major credit/debit cards, PayPal and instant online finance (powered by V12 Retail Finance). on our website and in store. When you place orders or access account information, we offer the use of a secure server. The secure server software (SSL) encrypts all information you input before it is sent to us. Furthermore, as required by the UK Data Protection laws, we follow strict security procedures in the storage and disclosure of information which you have given us, to prevent unauthorised access. Our security procedures mean that we may occasionally require proof of identity before we are able to disclose sensitive information to you. We may share information with governmental agencies or private companies assisting us in fraud prevention or investigation. We may do so when: (1) permitted or required by law; (2) trying to protect against or prevent actual or potential fraud or unauthorised transactions; or, (3) investigating fraud which has already taken place. We will not provide your information to any other company or organisation for marketing purposes. We will publish both positive and negative reviews that are objective, inoffensive and provide useful information about a product to potential customers. We have the right to not publish reviews that do not offer useful information or contain spam. We will also reject reviews that are not focused on the product that the review is concerning. Other reasons for not publishing a review may include the use of profanities, politically-motivated or discriminatory statements, and unqualified or unfair statements regarding a product, a manufacturer or Andertons Music Co. In providing our customers with a product review service, our aim is to help our customers make informed choices and differentiate between similar products; not to pretend that every single product we sell is flawless! If you would like to write a review, please remain objective, factual and inoffensive. State your honest opinion and we will most likely publish your review. If you would like to make a comment regarding our service, please inform us via the Contact Us page and not in a product review. 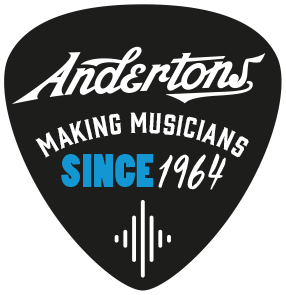 We would like to ensure that all of our customers are happy with their shopping experience at Andertons Music Co. So if you have anything to say, be it praise or criticism, we would welcome your feedback so that we can continually improve and offer you a high level of service. It is our aim to keep all information on this website correct, however we do not warrant the accuracy and completeness of the material on this website. We reserve the right to make changes to the material on this website or to products and prices described in the site, at any time without notice. The material on this website may be out of date, and we make no commitment to update such material. If you have any suggestions or comments on how you think we could improve this page, please email us using the contact form at the bottom of this website. The promoter is Andertons Music Co.
By entering any competition with Andertons Music Co. an entrant is indicating his/her agreement to be bound by these terms and conditions. The promoter is not responsible for inaccurate prize details supplied to any entrant by any third parties. Winners will be chosen by Andertons Music Co. The winner will be notified by email and/or DM on Twitter/Facebook within 28 days of the closing date. If the winner cannot be contacted or do not claim the prize within 14 days of notification, we reserve the right to withdraw the prize from the winner and pick a replacement winner.